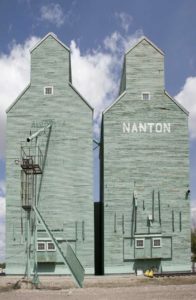 The Discovery Centre is Located in the last 3 remaining grain elevators in Nanton Alberta, we provide an interactive educational centre and museum displaying artifacts pertaining to the history of Southern Alberta, focusing on farming, grain production, and the railway association. We provide a guided tours helping children understand where the grain products come from, the process that is used to ready the grain for production, and then where it goes before it is in the stores. Thanks and we look forward to seeing you at The Canadian Grain Elevator Discovery Centre.